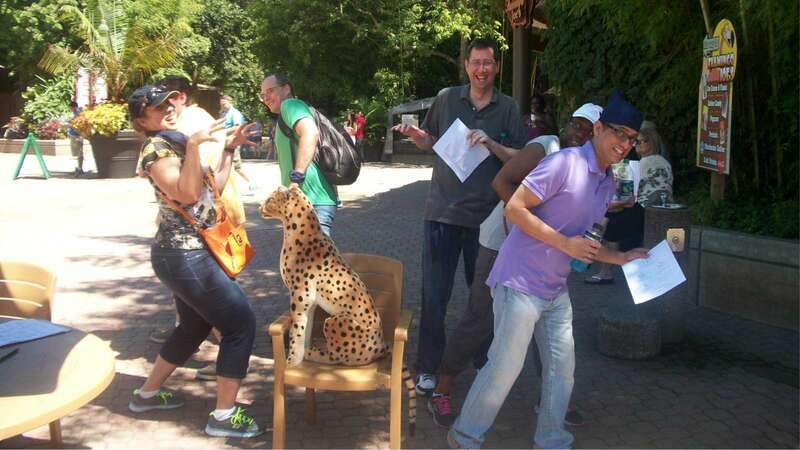 Explore Zoo Atlanta or Centennial Park in a fun paper-based teamwork scavenger hunt. Teams put on their thinking caps and their walking shoes in order to outsmart their competition in this fun and fast-paced team building scavenger hunt. Your team will solve puzzles, take pictures of themselves doing outrageous things, decipher codes, find secret locations, and face off against other teams in mini challenges while they work cohesively as a team in our longest running Atlanta scavenger hunt. Welcome & Warm-Ups (25-10 minutes) Atlanta Challenge staff welcome the participants and lead some fun warm-up activities. Event intro (5 minutes) Our staff review the rules and timeline for the program, and hand out any sup- plies the teams need. Brainteasers: Teams work on this collection of various mental challenges for extra points as they travel. Participants apply critical & creative thinking, and plan how to fit the extra projects into existing schedules. zone. They receive points for those they find and correctly identify. Rendezvous Challenges: These team-against- team challenges take place at a scheduled time and a secret location. Scoring (15 minutes) Teams reconvene at the starting area to finalize their scoring and begin working on their teamwork presentations. Practice collaborating and managing time. Build communication and listening skills. Have fun while getting to know each other and the venue.